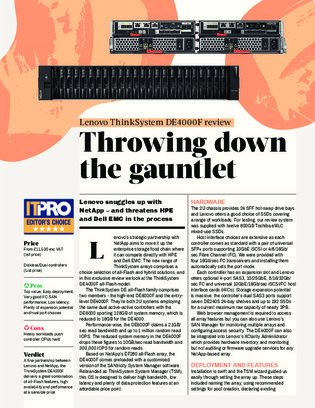 In its strategic partnership with NetApp, Lenovo is throwing down the proverbial gauntlet to long-time all-flash array contenders HPE and Dell EMC. With Lenovo’s new range of ThinkSystem arrays—comprising both all-flash and hybrid solutions—their sights are set on moving up the enterprise storage food chain. So, how do Lenovo’s new AFAs compare with the aforementioned vendors? Read this resource to find out. Included is a breakdown of the systems’ hardware, deployment, features, and FC performance.